Samsung has been at the forefront of AV innovation for some time now. This is a company that can proudly boast being number one in the TV market for the last eight years. But its latest innovation is something of a big sell. At CES 2014, Samsung's TV message was all about 'curves'. It, and unsurprisingly given their rivalry LG, spent a lot of CES convincing journalists that adding curves to its televisions enhanced the viewing experience. TechRadar was invited along to the company's European conference in Malaga, Spain, to learn a bit more about curved UHD TV and to find out just why being curvy is helping it usher in the 4K revolution. "We were experimenting for some years with the idea of curves," said Samsung's Michael Zoeller at the conference. "In 2006, we started out with the Bordeaux television range [this series consisted of crystal wine glass-inspired LCD TVs] and since then we have been looking at different shapes for a TV." Given the explosion of flat-screen televisions in the market – even before the rise of HD – it is no easy thing to change consumers' perceptions of why the physical look of a television should change, but Zoeller insists that adding a curve is an obvious evolution. "We started to experiment with forms but found by creating the curve, you create a more cinematic experience. After three or four years work, we are glad to have this in the market." This cinematic experience is key to the idea of a television with a curve. According to a Samsung spokesperson who talked TechRadar through the idea for the new television, it is "a form factor that improves the quality experience". "There is a specific curvature of these TVs, which is 4.2 metres," said the spokesperson. "This is the same radius that is naturally found in the eye." The idea is that by aping how the eye views images, if you hit the television's sweet spot the curve will mean that all areas of the screen are equidistant to the viewer. And, with Samsung's curved UHD TVs, this is enhanced with some software improvements. 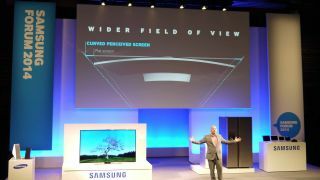 "The TV analyses the curve of the screen and uses something called Depth Enhancement Technology to split the screen into layers and offer that sense of depth," said the Samsung rep.
To show the technology at work we watched a jungle landscape chopped up into bits and were guided through the depth on show. All this was impressive but it still begs the question: why bring curved into the Ultra HD equation, when 4K is still a nascent technology yet to be fully understood by the general public? "10 years ago LCD and HD came to the market, we found both technologies were driving themselves," said Zoeller. "And we are expecting a similar story with UHD TV. The 4K content is there and with the curve form factor, they will drive each other." For those still not convinced that curved is the natural successor to a flat screen, Zoeller was adamant that this is the future of TV (especially for 4K) and something that Samsung is completely behind. "I 100 per cent believe that 'curved' is the next big thing," he explained. "TV has a huge amount of money invested into it. The way House Of Cards and Breaking Bad have been filmed in 4K, they are for large 'cinema-like' screens. "They want you to see the detail. TV is becoming more and more important and the logical step is to create the cinema experience in the home. "In two or three years, the majority of TVs in the home should be curved."